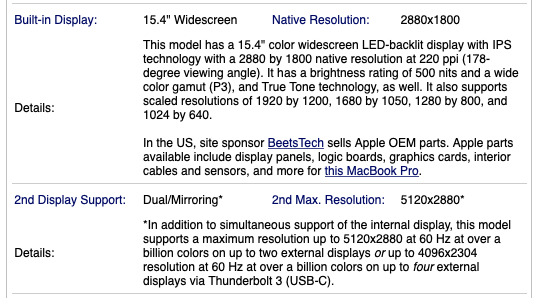 How do I find out the number, type, resolution & refresh rate of additional monitors I can attach to my MacBook or MacBook Pro? There are perfectly good resources out there that Ask Different should not have to duplicate the efforts of. EveryMac, as the name suggests, has information on every Mac model ever made [also iPhones, iPads, iPods], including but not limited to the number of external displays supported & their maximum specification. Lookup Macs, iPods, iPhones and iPads by Apple Order Number, Model Number, EMC Number, Model Identifier, Serial Number and Intel processor number. This is an example of the data they provide for the current 2018 Core i9 15"
I have no affiliation to EveryMac, their partners, advertisers or sponsors. @Tetsujin answer includes very good third party options. But I often find direct information is better instead of going to a third party. Not the answer you're looking for? Browse other questions tagged macbook display usb hdmi displayport . Any way to connect 3 external displays to a 2018 Retina MacBook Air? Is there any screen with resolution of 3440x1080 that is supported by a mid 2012 13" MBP? Can MacBook Pro/Air models with just two Thunderbolt 3 ports support two external HDMI displays? How to reach full resolution potential with MacBook Pro 2012?